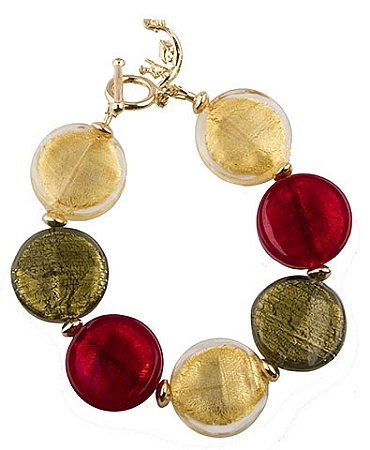 Rich Christmas colors of Crystal/Gold, Red and Olivine combine to make just the Venetian Glass Jewelry you need to add to your collection. The beads are all lined with 24kt gold foil and the toggle clasp and saucer beads are gold fill. The length of this bracelet is nominally 7 inches. It can be lengthened or shortened upon request. Please put your actual wrist size in the comments (click here for ruler) and we will make to fit. Modifications will slightly alter the design but will maintain its beauty. Our signature gondola is included.